Streusel. That delicious crumbly topping made from a mixture of butter, flour, sugar, and ground cinnamon. Did you know that the word 'streusel' comes from the German word 'streuen' which means 'to sprinkle' or 'to scatter'? Which is exactly what we do with streusel. We sprinkle it on top of our coffee cakes, muffins, pies, fruit crisps and crumbles, as it adds a touch of sweetness and crunchiness to our baked goods. While you don't often see a streusel topped scone, it really is a good idea. The crunchy sweetness of the streusel makes this Blueberry Streusel Scone extra special as it goes so well with the sweet tanginess of the blueberries. So try it and you may find yourself sprinkling a little streusel on all your scones. The cultivated blueberries we enjoy today are much larger and more plump than their wild cousins. Great for eating out of hand, they are also the perfect berry for using in our baking as heat turns them soft and sweet. 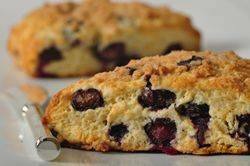 The only thing to remember is to gently fold the blueberries into the scone dough to prevent them from being crushed. Now, if you are using frozen blueberries (do not thaw first) don't be surprised if the dough has streaks of blue, as frozen berries always bleed a little no matter how gentle you are when folding them into the dough. Most of the time scones are simply brushed with a little cream (milk) or an egg wash before baking. For these Blueberry Streusel Scones, we are still going to brush the scones with milk, but then we are going to sprinkle them with some of the streusel. You will probably have some streusel leftover. Now, don't throw it away as it can be stored in a covered container in the fridge for a few weeks or it can be frozen. And use it to sprinkle on your other scone recipes, or muffins, cakes, or even your favorite crisp or crumble recipes.